Standing at the kitchen counter, Harper Beckham looks like she loves cooking – and dad David is clearly proud of the seven-year-old’s efforts, posting the picture on Instagram. But not everyone is as keen in the kitchen as little Harper, and it seems we are a nation of corner-cutters when it comes to getting our hands and worktops dirty. Michelin-starred chef Tom Kerridge is teaching parents to cook from scratch on his new show Fresh Start, and fitness guru Joe Wicks has teamed up with meal delivery service Gousto, which brings you ready-weighed food and recipes to your door. It all begs the question – have we forgotten how to cook from scratch? And why? 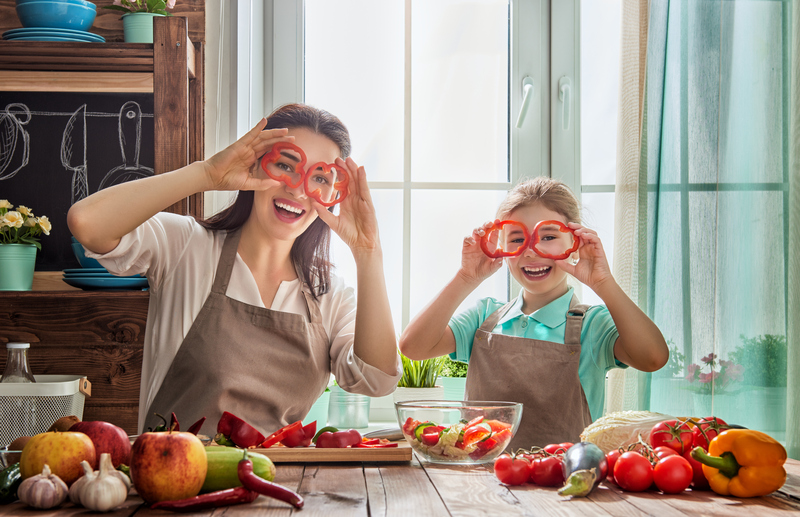 If you want to try getting back into the kitchen – particularly with your children – then here are some handy ways to try and start. Recipes that call for a lot of spices can flummox you. You’re tired, up against the clock and suddenly need to find some fennel seeds. It’s much easier to just buy a jar of sauce, right? Well, not always. Real herbs and spices are a game changer when it comes to flavour. To make it a family affair, start growing some herbs with the kids (weekend project ahoy!). If the kids prefer plainer food, then you can always add some basil or coriander to your dish once you’ve served theirs. Craving Chinese or Indian food? One of the best ways to deal with it (financially as well as satisfying your hunger) is to get on board with fakeaways. Cooking your fave dishes instead of ordering them will give you a huge sense of smugness and achievement. And you won’t have to wait 45 mins for them to arrive. The best part is the calories you’ll save, not to mention lower salt and sugar in your home-made options. If home-made pizzas are good enough for the Duchess of Cambridge, then surely they’re good enough for you and your family. We’ve all been there in the supermarket as everyone argues over which topping they want on their pizza. Making your own means you all get exactly what you want. Add some of those herbs, while you’re at it. Does your child know that you used to love tuna pie Tuesdays? It’s time to let them know. You could always ask your own mum or dad for a recipe from your youth and try to recreate it. Pies are easier than you think thanks to pre-rolled pastry. Jacket potatoes are a fun ‘make it together’ dinner that’s cheap, too. If you’ve lost count of the times you say you don’t have time to cook a large meal, then a slow cooker is the answer. Load it up in the morning, and by the evening, there’s your casserole ready to go. It’s so easy that kids of all ages can help. Meal delivery services all come with recipes – but it’s likely you’ve got tons of cookbooks at home already, sitting on the kitchen shelf gathering dust and fat particles from the air. Get them down, put your smartphone to one side and get the kids to join in, picking their favourites. We guarantee you’ll be reminded of things you used to love making, and also perhaps inspired to try something new. Shouting ‘DINNER!’ upstairs when you’ve been cooking alone is not the most inspiring way to cook. Instead, plan a meal where the children can take part, too. Pizzas are one thing, but there’s also stir-fry (max chopping skills for older children), cakes (the best helper gets to lick the bowl) or a good old roast. This is a biggie for Tom Kerridge in his new show: sit down together to make the dinner table a place of communion. This is where you catch up on your day and your plans. So if it’s slipped off your radar, now’s the time to make sure you sit down and eat as a family. Fancy tablecloth optional. If the knives are blunt, the wooden spoon is cracked and the roasting tray has seen better days, it’s time for a restock. Grab the kids and head to stores like TKMaxx or your local supermarket for some chef’s essentials at reasonable prices. Choosing the things to cook with will inspire the children; they’ll want to use ‘their spoon’ or ‘their bowl’ if they’ve picked it out themselves.